When visiting Mexico, it only makes sense to stay in a property that is authentic to the traditions and history of this beautiful country. 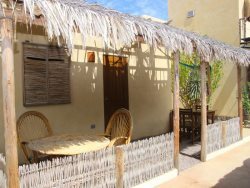 This palapa fills that requirement, as it offers great outdoor living opportunities while still providing a comfortable environment. Wireless Internet in the palapa as well as the pool common area.